Most of the objects contain other objects. Open the VB Editor (press ALT+F11) and open any existing module under Project window. We have opened ShowSumOf macro. 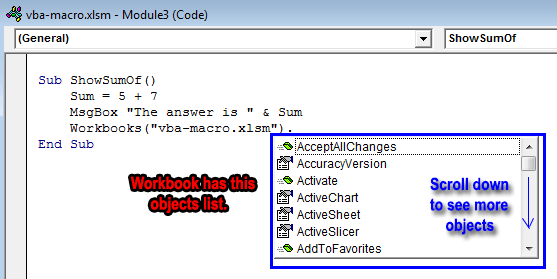 Start writing this code Workbooks(“vba-macro.xlsm”). in the Code window like the following figure. ChartObject: A chart related object. PivotTable: A PivotTable related object. PageSetup: This object sets printing information. You can examine an object’s current property settings and do something based on these settings. You can change the object’s property settings by setting new values. Look at this VBA statement: Range("E10").Value. In this statement, Range is an object, Value is its one of the properties. In the VBA statement, objects and properties are placed side by side separating them by a period (a dot, .). Objects are placed first, then its properties. For example, the following VBA statement sets the Value property of Range E10 to 100. That statement will cause number 100 to display in the cell E10. Some properties are read-only. Read-only properties mean that you can examine the property, but you can’t change the property. Say you have selected a single-cell Range object (say it is Range(“E10”)), you can only find out what is the column text and row number using Column and Row properties of the Range object. You can’t change the values of column and row of selected object Range(“E10”). Note: It is interesting that Excel doesn’t have a Cell object. When you want to manipulate a single cell, you use the Range object (Range(“E10”)). If more than one workbook is open, the second or third method isn’t reliable. You have to use a specific name for the workbooks. When you are working with an active sheet, any of the last three methods would work. The first method is the best choice as this statement refers to the sheet specifically. In VBA code, methods look like properties. Methods are connected to the objects with a separating operator (.). However, methods and properties are different concepts in VBA. Like all programming languages, VBA also works with variables. In VBA you don’t need to declare variables explicitly before you use them in your code. But it is a good practice to declare variables before using them in the code. Note: Sometimes you may find that your VBA module contains an Option Explicit statement at the top of the module. This instructs you to declare all variables in the module. Undeclared variables, in this case, will result in a compile error, and your macro procedures will not run. After the statement is executed, you can work with the variable InterestRate in other parts of your VBA code.